Segundo post desde la Gran Manzana. 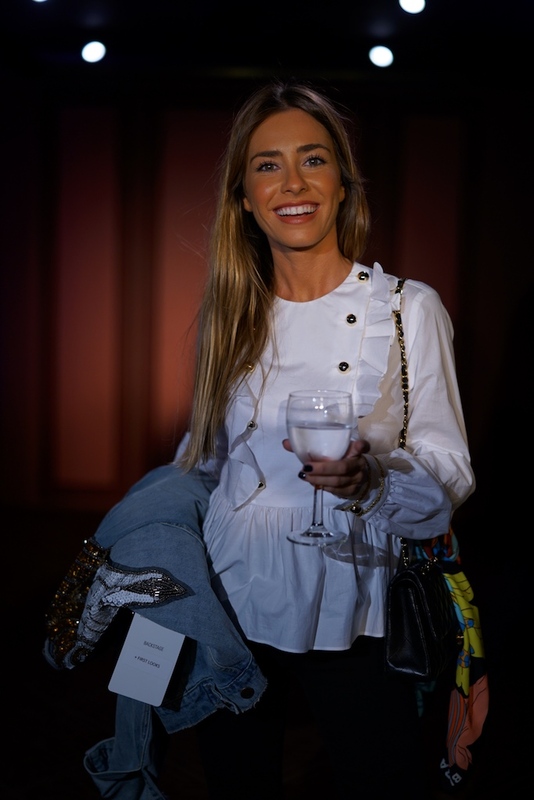 Aunque las Fashion Weeks consistan en ir vestidos lo más extravagantes y diferentes a lo normal posible (o lo más hortera en muchas ocasiones), también hay días en los que a mí personalmente me apetece vestirme más casual y normal. Por eso esta vez opté por ponerme unos jeans ajustados con rotos combinados con mi camisa blanca con volantes y botones dorados, a juego con mis botines dorados. El toque que más me gustó y que más llama la atención del look son justo los botines y la cazadora vaquera con todas estas lentejuelas bordadas a modo de alas. Es por lo que más me preguntasteis en las redes sociales. Los dos primeros días que pasé en Nueva York dormí en el Hotel Room Mate Grace que está súper bien ubicado en pleno Time Square, una de las zonas más bonitas y comerciales de Manhattan y que me encanta recorrer ya sea de día o de noche. Ahí os recomiendo comer en Hard Rock o en Bubba Gump, dos de los restaurantes más típicos aunque también llenos de turistas. Para el resto de la semana me cambié al Hotel 48 Lex que está muy cerca, como a 10 minutos andando, pero un poco más hacia el norte y cerca de Central Park. Me gusta estar en hoteles por esta zona porque pasear por Central Park es algo que me encanta hacer siempre que visito NY y también porque esta es la zona más “céntrica” de la isla. Hacia el Norte está el parque y los museos, hacia el Sur Brooklyn o el Soho. Y al Este y Oeste tenemos East o West Village. Este día íbamos al desfile de Brandon Maxwell que tuvo lugar en un hotel en la 5th Avenida enfrente de Central Park, por lo que hicimos las fotos por la tarde en las calles que íbamos recorriendo de camino al desfile. Lo bueno de NY es que es muy muy fácil orientarse y no perderse. Todas las calles van perfectamente ordenadas de la 1 a la 174 en horizontal y las verticales son avenidas de la 1 a la 12 con algún nombre entre medias (aunque desde Houston hacia Downtown los nombres de las calles cambian un poco). En esta zona os recomiendo pasar a tomar el té por el Hotel Plaza, que está buenísimo y después ir a tomar una copa al hotel Dream el domingo después del brunch (el hotel donde suele ir “Manhattan’s elite”). Mañana sigo con más y espero que os estén gustando estos consejos y recomendaciones. Second post from the Big Apple. Although Fashion Weeks consist on dressing as extravagant and different as possible (or more tacky in many occasions), there are also days when I personally feel like dressing more casual and normal. That’s why this time I chose to wear my ripped skinny jeans combined with my white shirt with ruffles and gold buttons, matching my gold booties. 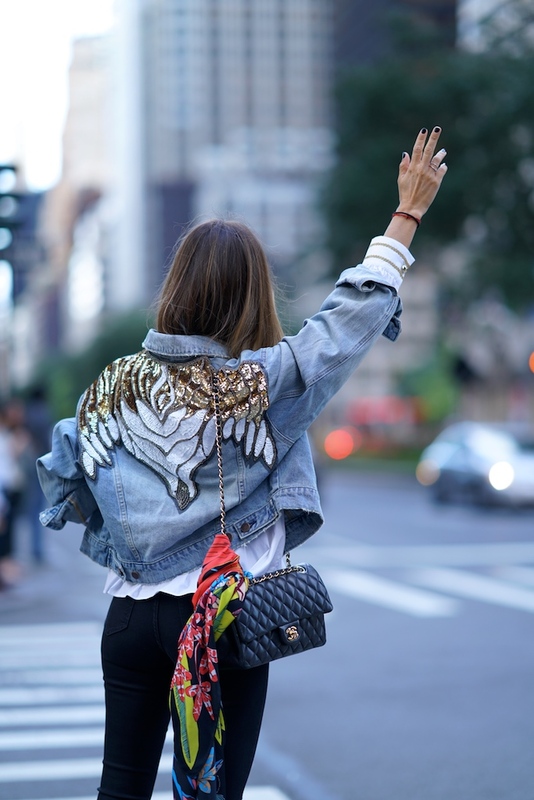 The touch that I liked the most and which attracts almost all the attention of the look are just the booties and the denim jacket with all these sequins embroidered as wings. That’s what you asked me the most on my social networks. The first two days I spent in New York I slept at the Room Mate Grace Hotel which is super well located in Time Square, one of the nicest and most commercial areas of Manhattan. I love to walk around there at any time of the day or night. Here I recommend you eating at Hard Rock or at Bubba Gump, two of the most typical restaurants but also full of tourists. For the rest of the week I switched to the 48 Lex Hotel which is very close, about 10 minutes walking, but a little further to the north and near Central Park. I like to stay in hotels around this area because strolling around Central Park is something I really like to do whenever I visit NY and also because this is the most “central” area of ​​the island. To the North you have the park and the museums, to the South Brooklyn or Soho. And to the East and West we have East or West Village. This day we were going to the Brandon Maxwell fashion show that took place in a hotel on the 5th Avenue just in front of Central Park, so we took the photos in the afternoon in the streets while we were walking on our way to the show. The good thing about NY is that it is very very easy to get around and not get lost. All the streets are perfectly arranged from 1 to 174 horizontally and the verticals are avenues from 1 to 12 with some names in between (although from Houston to Downtown the names of the streets change a little bit). In this area I recommend you go to have a tea at the Plaza Hotel, which is great and then go to have a drink at the Dream Hotel on Sunday after the brunch (the hotel where usually go “Manhattan’s elite”). Tomorrow I will continue telling you more things and I hope you are enjoying these tips and recommendations.